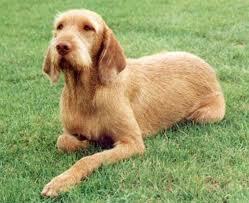 The Vizsla was developed in Hungary in 8th century. This breed of dog was used for hunting purposes and was true champion of their work. This breed of dogs became rare after the world war II. This breed of dog has a tendency to hunt in any area and in any weather they can hunt in forest, Fields and in Mountains. They have nice and quit nature and are easy going with their masters. This breed of dogs is quite friendly with their master and family. This dog makes strong belonging to their master and can become destructive if they are left alone for long duration of time. They do well with children and older people and can be a good choice for home if they are socialized properly. Due to their hunting instincts they run behind any thing which moves. The Vizsla breed's coat comes generally in two varieties. The Smooth and the Wire: The Smooth is short, dense close to the body where as the Wire is hard, harsh and loose fitting. The Vizsla coat colors range from golden to russet. They are average shedders. This breed of dogs require early age socialization and obedience training. Training should be given with fairness and patience, they will not respond to hard and harsh methods of dog training. The Vizsla is a very energetic breed and needs regular exercise. They love to go for regular walks and enjoy family play session. They are not recommended for apartments. This breed requires brushing occasionally with a firm bristle brush and bathing should be given to them when required with dry shampoo. It is important to check their nails and ears consistently. The Vizsla is generally a healthy dog breed with no known dog diseases and health problems, but has a tendency toward hemophilia and hip dysplasia. They do not tolerate cold climates and thus should not be exposed to extreme cold weather.